The Ilakaraeta primary school in Kerema town of Gulf Province has lost a double storey classroom in a fire that started in one of the classrooms between 3-4am in the morning. The double storey classroom was built at the cost of K1.7 million fours year ago and it was used by the grade 7 and 8 students of the school. Parents and Citizens (P&C) chairman of the school Mr Sam Koraea said it is a big loss for the school and they will need funding from the provincial government to rebuild a new classroom. Mr Koraea said the grade 7 and 8 students will have to use other classrooms, however it will still affect the entire operation of the school. 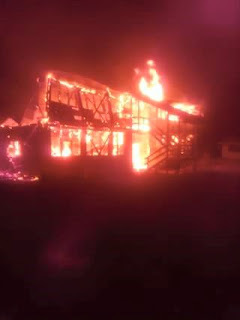 Meanwhile the Mr Koraea and the teachers are not sure how the fire may have started but the police are investigating. A frustrated Mr Koraea called on the police to do a thorough investigation in order to address this issue that will cost the school a lot of money.